Can the next U.S. president make public universities more affordable–and can the federal government do anything to support crucial research that takes place in these institutions? 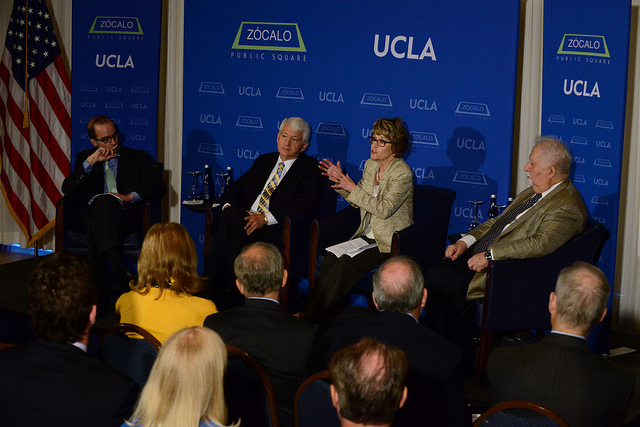 Yes, said UCLA Chancellor Gene Block, University of Michigan President Mary Sue Coleman, and Carnegie Corporation President Vartan Gregorian, in a panel co-presented by UCLA at the National Press Club in Washington, D.C.
David Leonhardt, Washington Bureau Chief of The New York Times and the program’s moderator, opened the conversation by citing Kanye West’s album The College Dropout–which suggests that dropping out of college might be better, financially, than staying in. “Is college worth it?” he asked. Coleman said that before we can debate over whether college is a worthwhile investment, “we need to agree on the data.” She said that, according to the Federal Reserve, close to three-quarters of all students take on debt that’s less than $25,000–and at the University of Michigan, for families making under $80,000, college today is less expensive than it was in 2004. But, she said, universities need to better educate parents and students on how to take on debt and how to manage it, especially when a kid is the first in her family to attend college. Gregorian agreed that the starting point of the conversation is wrong. “We confuse job and career,” he said. “We shortchange students when you’re defined by the job you hold.” Definitions of success need to change. “Is there,” asked Leonhardt, “enough performance-based financing in higher education?” Should aid to students be based more on their performance–and should funding to colleges be based more on student graduation rates? It’s reasonable to expect better graduation rates, said Block. But many of the problems universities have with students not progressing or dropping out is a result of their being underprepared by their K-12 education. This led into the question of whether the recent push to change STEM education in our K-12 school system has had a positive effect on math and science at the university level. Coleman said that engineering applications–many of them domestic–are soaring. She believes it’s in part a result of a national conversation about a need for engineers and biomedical engineers in the country. But Block thinks a large number of students are still “not getting the skills they need.” Gregorian said that President Obama’s challenge to train thousands of more science teachers is working–and he hopes to see the fruits of it soon. Top universities have made a great deal of progress in many kinds of diversity–but not economic. What, asked Leonhardt, is the reason? Coleman said that it’s an issue that has long puzzled the University of Michigan. Research a decade ago showed that loans–no matter the size–were scaring families away, so the university has replaced many loans with grants. She thinks families may be so afraid of the financial burden of college that they don’t let their children apply. 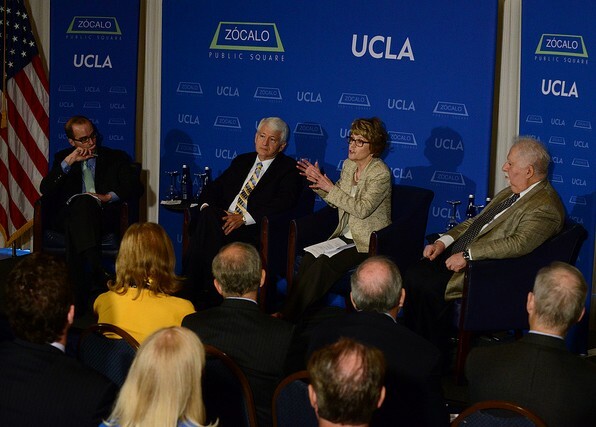 Block said that UCLA has been helped by the California Master Plan for Higher Education, which results in a large number of transfers from community colleges. Students who have succeeded in community colleges save money and are also more likely to succeed at the university. Grades, he said, are a better indicator than board scores. “We should not sacrifice diversity for economics,” said Gregorian. “We have in many ways nationalized opportunity. We have democratized access.” But we haven’t figured out how to pay for it. Both Michigan and California have banned affirmative action, but Coleman and Block agreed that diversity is crucial–and that it’s frustrating not to have this opportunity to admit more students of different ethnicities. Socioeconomic diversity, said Coleman, is not a good indicator of racial and ethnic diversity. And numbers, said Block, “make a difference.” Being the only African-American student in a class can be a difficult experience. Block said that the state of California is not going to have more resources for higher education. But the federal government can help by making higher education a higher priority. The private sector, too, should be investing in universities. “We’re going to have to look for industries and companies to help support public higher education,” he said, calling for a new partnership among the federal government, private companies, and public universities. Gregorian said that higher education is a 150-year, multibillion-dollar investment that America can’t afford to waste. He, too, agreed that collaboration is necessary–both within higher education and beyond. “Our universities have to collaborate,” he said. “They cannot always duplicate. They have to create regional, national consortiums.” And by collaborating with the government and with private industry, universities also might be able to transform the nation’s infrastructure. Read an essay on the past and future of public universities here. Read opinions from higher education experts on how public universities can compete with private institutions here.